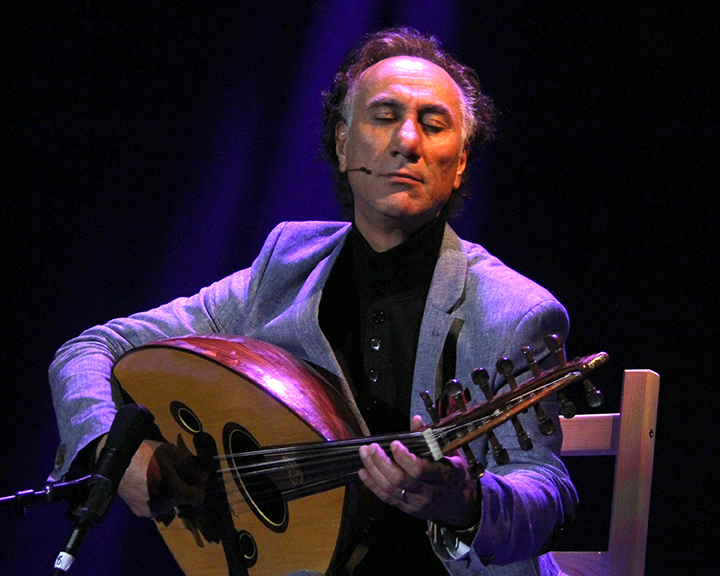 Rahim AlHaj, one of the world’s best oud players, is a performer and composer whose wide-ranging music serves as a bridge between cultures. His instrument, a big-bodied, short-necked lute, dates back at least 5,000 years and is popular throughout the Middle East and the Arab world. 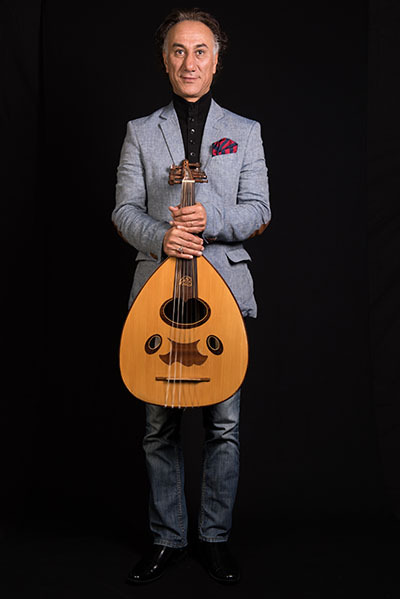 AlHaj fell in love with the oud at age 9, in his native Baghdad, Iraq, when a teacher brought an instrument to school. The child asked to touch the oud. The teacher was so moved that he began teaching him to play and eventually made him a gift of the instrument. By age 13, AlHaj had established a reputation as a performer and composer. He was among five successful applicants out of a field of 2,000 to gain admission to the Institute of Music in Baghdad. 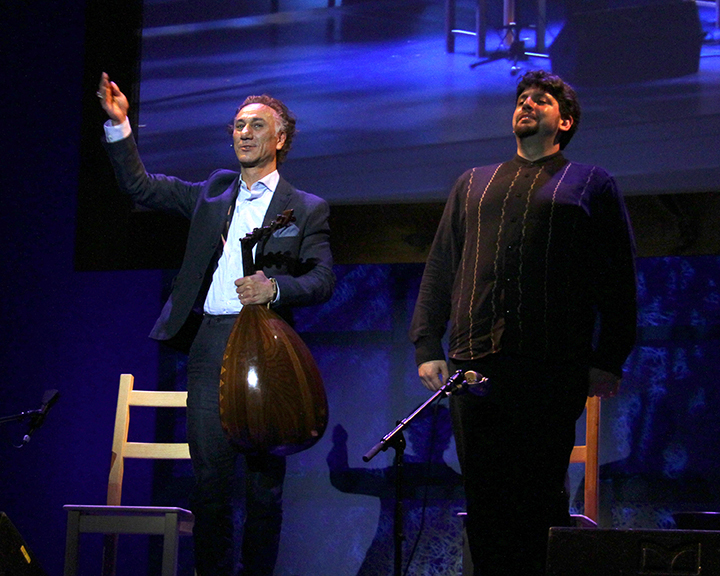 There, he studied under the renowned oud player Munir Bashir and composer and with performer Salim Abdul Kareem. After joining the underground opposition to dictator Saddam Hussein, AlHaj composed “Why?” The song, with lyrics from a friend’s poem, became the movement’s anthem. AlHaj was imprisoned twice for his political activity and tortured while in captivity but said the most painful thing was being separated from his instrument. Despite these problems, he graduated from the conservatory in 1990 and joined Bashir on international tours. The following year, however, during the first Gulf War, AlHaj was forced to leave his homeland. His mother helped procure the necessary papers and sold her belongings to finance his trip. He moved first to Jordan, then to Syria, where he met his wife. In 2000, they moved to the United States and settled in Albuquerque, New Mexico. After working briefly as a dishwasher and a night watchman, AlHaj rented a hall at the University of New Mexico for a solo concert. The overwhelmingly positive response revived his career, and he now tours widely at home and abroad. Two of his ten CDs have been nominated for Grammy Awards. He has composed for string quartet and symphony orchestra and his own six-member Little Earth Orchestra and worked with musicians as diverse as Indian classical musician Amjad Ali Khan, jazz guitarist, composer and arranger Bill Frisell, the Kronos Quartet and the rock group R.E.M. 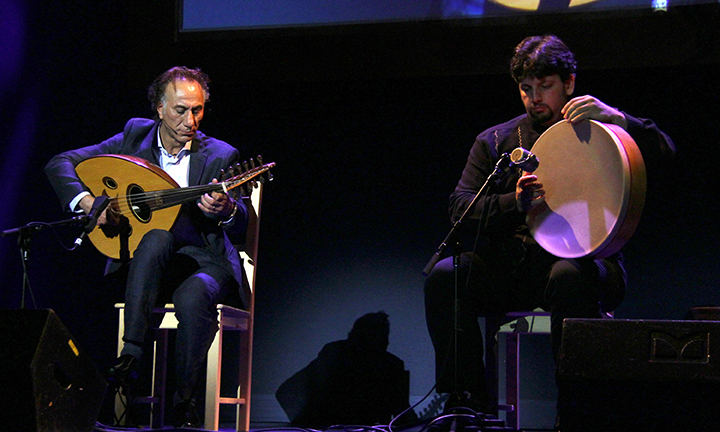 His music combines traditional Arabic melodic modes, or maqams, with Western forms. “I am obsessed with stories of women and children,” he has said. “I am trying to be their voice.” He once used an Australian digeridoo to emulate the sound of Iraqi women mourning. AlHaj has become a U.S. citizen and was awarded a United States Artists Fellowship in 2009. Of his adopted land, he told an interviewer, “America is a wonderful place -- the country is gorgeous and the people are so open and welcoming. But Americans are very isolated…If I can do anything while I'm here, I'd like to help them understand other parts of the world." Kelly, Jon. “Oud awakening.” BBC News: Talking America, September 20, 2008. http://www.bbc.co.uk/blogs/talkingamerica/2008/09/oud_awakening.html. AlHaj, Rahim. The Second Baghdad, VoxLox Records, 2002. ________. Iraqi Music in a Time of War, VoxLox Records, 2003. ________. Home Again, Fast Horse Recordings, 2007. ________. Little Earth, UR Music two-CD set with several guest artists, 2010. ________. Journey, UR Music, 2014. AlHaj, Rahim, with the Saddaqa String Quartet. Friendship: Oud/String Quartet Ensemble, Fast Horse Recordings, 2005. AlHaj, Rahim, with Souhail Kaspar. When the Soul Is Settled: Music of Iraq, Smithsonian Folkways Recordings, 2006. AlHaj, Rahim, Ottmar Liebert, Jon Gagan and Barrett Martin. Under the Rose, UR Music, 2009. AlHaj, Rahim, with Amjad Ali Khan. Ancient Sounds, UR Music, 2009. ________. Infinite Hope, UR Music, 2015. 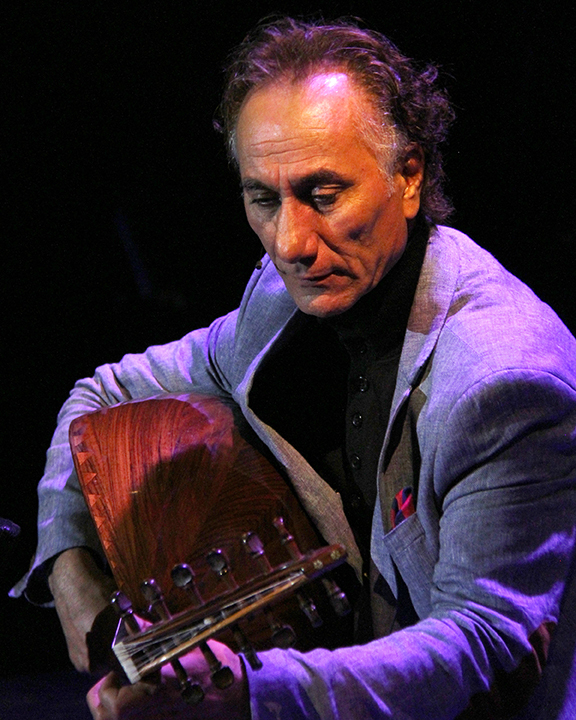 Rahim AlHaj performs at the 2015 National Heritage Fellowship Concert, Washington, D.C., courtesy National Endowment for the Arts. 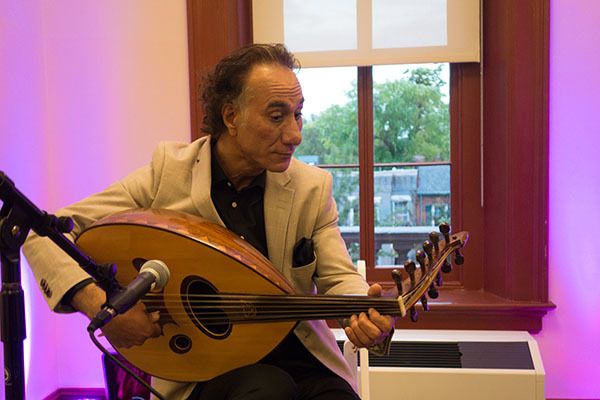 Rahim AlHaj talks about being a student of Bashir, interview by Alan Govenar, Washington, D.C., 2015. 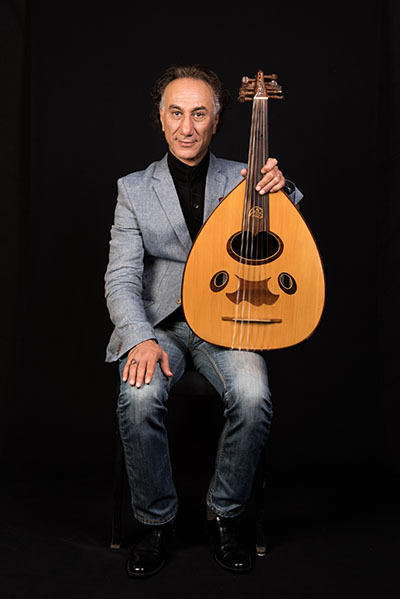 Rahim AlHaj talks about his introduction to the oud, interview by Alan Govenar, Washington, D.C., 2015. 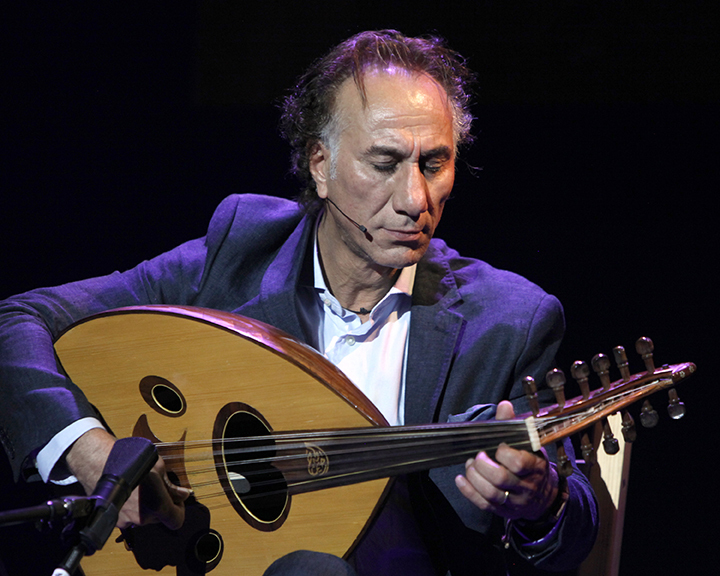 Rahim AlHaj talks about the quarter tone, interview by Alan Govenar, Washington, D.C., 2015. 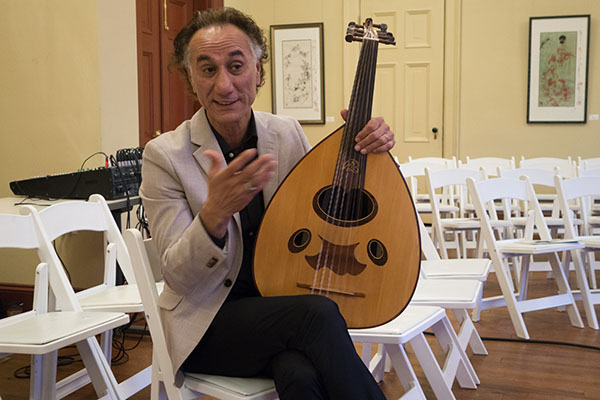 Rahim AlHaj talks about the scales in Iraqi music, interview by Alan Govenar, Washington, D.C., 2015. 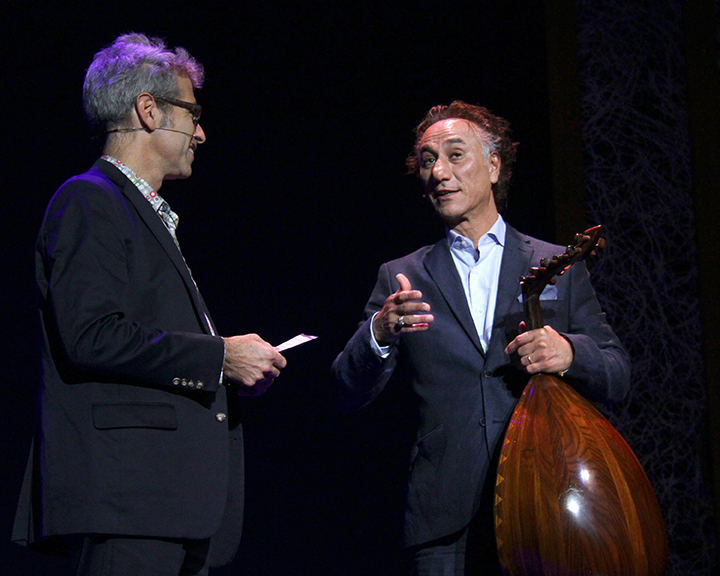 Rahim AlHaj talks about the styles of the Oud in different cultures, interview by Alan Govenar, Washington, D.C., 2015. Rahim AlHaj talks about what he'd like the audience to take away from his performances, interview by Alan Govenar, Washington, D.C., 2015.